I LOVE "The Dish" by Susie Costaregni. I hope I am spelling her name right. I refuse to spellcheck it, because if an excellent speller like me can't get your name right, well, there is something wrong with your name. Scene ... Actor Michael Douglas, his wife, actress Catherine Zeta-Jones, and their two children, son Dylan and daughter Carys, who are renting a home in Bedford, N.Y., were seen last Sunday night in downtown Stamford near Napa & Co. Zeta-Jones won a Tony Award last week for Best Actress in a Musical for her role of Desiree in "A Little Night Music" on Broadway. What the hey! Why couldn't I have spotted them? I wonder what they were doing. Were they at Napa and Co? Scene ... Riverside residents and TV personalities Kathie Lee and Frank Gifford and son Cody were recently seen having dinner at Terra Ristorante on Greenwich Avenue. 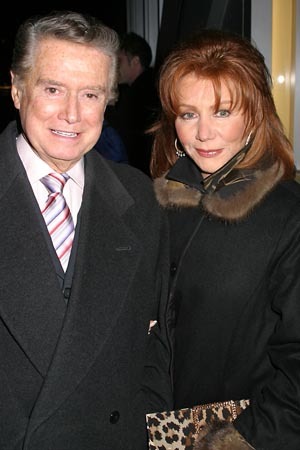 On the other side of the restaurant were TV personalities Regis and Joy Philbin, who came in for dinner but left shortly after being seated. Toooootally awkward. I love it. I love awkward stuff. Oh and also? Is Terra really that great? I've been there once and it was OK... but that was for lunch. Maybe for dinner, with the wine flowing, it's a beautiful romantic little space. Because really, the appeal of Italian food, no matter how good... is the wine that goes with it! In all my years of reading The Dish, I believe this is the first truly awkward item I've read. And I loved every second of it. Well played, Susie, well played. here here on the wine! Haha, they were NEAR Napa & Co.
Maybe they heard about the $75 burger and went to Barcelona instead! That is because I went there with my 17-month-old, and the servers obviously didn't want to serve a table with a baby. We sat there for 20 minutes while the servers walked to and fro past our table--didn't even give us water or silverware. So, we left and went up the street to Pasta Vera, which was quite tasty as well as receptive to babies. Catherine Zeta-Jones is just so hot!